Thanks are due to Dave Casson (pictured) and John Barnes for sourcing our new (to us) workhorse. Due to concerns with issues of safety when moving boats on cradles in the yard. 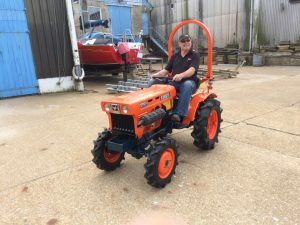 The Committee decided to invest in a used Kubota compact tractor. Similar to the ones used by the RNLI. These machines rarely become available especially in good condition. But after extensive trawling of dealer Websites we have managed to purchase an excellent example and it arrived at the Club on the 13th of June. With a certain amount of hilarity driving it on and off the Red Funnel ferry. It has a diesel engine with a very low crawler gear and 4 wheel drive. Over the next few weeks it will be fitted with a front tow hitch in order for the driver to face the load and control the towed cradles better. In addition the existing Club cradles will be modified to accept “A” frame type towing bars so that they can be pulled and pushed as well as steered more efficiently. This is a major investment for the Club (over £5000) and along with the need to use it in a safe manner a programme training of approved drivers will take place.